Jack has found a monster! Can you help him make the right choices and lead him through this amazing interactive story book to live happily ever after? This interactive book has a large number of story paths, creating a new experience with every read and will keep story time endlessly entertaining. Containing fully animated and interactive pages. Progress through the story by interacting with the characters and finding clues as you go. You can also use the helping eye to guide you if things get tricky. All pages and story options are fully narrated. This is optional, so you can choose to either read it yourself or have it read to you. Learn the importance of being truthful through a series of moral choices. This book saves your progress, enabling you to continue reading at any time. 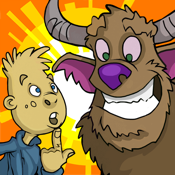 A company dedicated to creating fun games for iPhone, iPod and iPad. Our team have the expertise and experience to produce top quality games to the highest standard.